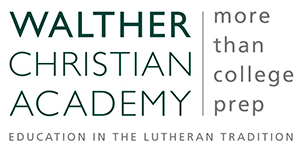 Walther Christian Academy serves students in middle school through high school. With a full range of academic and extracurricular programs, championship athletics, and a fine arts and music program, Walther offers students the resources to excel. For advanced students, the Academy offers more than 100 online college-level courses. Students graduating from high school at Walther Christian Academy are prepared to succeed in college and their chosen careers. Walther’s diverse school community reflects an increasingly diverse world, encouraging cultural sensitivity, respect, and appreciation of others. Ten percent of Walther seniors in 2018 were Illinois State Scholars. One hundred percent of graduating seniors in 2017 was admitted to a college or enlisted in the Armed Forces, and 30 percent received scholarship offers, totaling over $6 million. Walther’s STEM (Science, Technology, Engineering, and Math) focused middle school, utilizes an education curriculum based on the newest standards in science education: The Next Generation Science Standards (NGSS), developed in collaboration with Concordia University Chicago and made possible by CLEF’s financial support. The STEM curriculum provides cutting-edge teaching that meets each Walther middle school student at his/her level and prepares them to be consumers and developers of science in the future. At the end of the year, students participate in a STEM challenge that brings together science objectives and connects to other content areas of Math, Engineering, and Technology. Walther Christian Academy has full recognition from the Illinois State Board of Education.